Here are the details of Phonemic Awareness bingo. Phonemic awareness is the ability to associate letters with sounds, Building up phonemic awareness is the first step to learning to read with phonics, Phonemic awareness bingo is a game designed to help students improve their phonemic awareness. Each student is given a bingo card or bingo worksheet containing a different random selection of letters, and a marker pen (or set of counters). The teacher (or parent) chooses a letter at random, and reads out a common word beginning with that letter, for example, if the letter was "A", the parent or teach might say "Apple" or "Ant". Students have to figure out which letter begins the teacher's (or parent's) word, and then look for squares containing that letter on their bingo card or worksheet. If they find it, they cross off that square (or cover it with a counter). 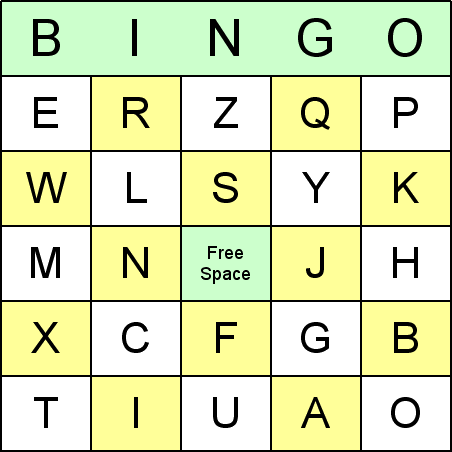 Students start off with one square they can mark off without waiting for it to be called out - the "Free Space" square in the middle of the bingo card. If you want to play a long game: The winning pattern could be to mark off every square on the bingo card. Please note however, if lots of your students are prone to miss matches, you might never get a winner this way! Also, note, if using only 26 letters, then all the students are likely to finish at more or less the same time (since the bingo cards contain 24 callable squares) - however, there is a way round this which we will discuss in our Suggestions for Variations of the game (see below). If you have lots of students, and want to have multiple winners: You could have multiple winner patterns - the first winner is the first student to mark off all four corner squares, the second winner is the first student to get a straight line of five marked off squares, the third winner is the first student to get two intersecting lines of five, and the fourth winner is the student who is first to mark off all the squares on their bingo card. Here are some free printables for playing Phonemic Awareness bingo. They include a call sheet (for the teacher or parent to use for bingo calls), and a set of 8 bingo cards to give to the students. Try removing a letter from the bingo cards, and replacing it with one or more letter-pair beginning with that letter. For example, instead of putting "C" on the bingo cards, you might print bingo cards with "CH", "CL" and "CR" - in this case, the teacher would make distinct bingo calls, depending on the particular letter-pair, for example "chain", "close" and "crate". This variations allows you to play a longer game, and also can solve the problem of everybody finishing at more or less the same time, if only using 26 letters and requiring a full bingo card of marked off items as a winning pattern. 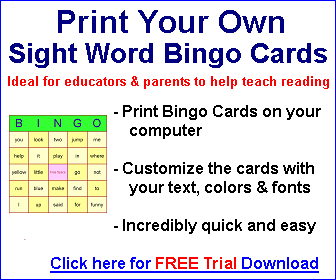 The Phonemic Awareness bingo printables on this web site were produced using the registered version of the Bingo Card Printer software. You could easily make your own bingo games using the same method. Choose Alphabet (Upper Case) or Alphabet (Lower Case) (depending on whether you want the bingo cards printed with upper or lower case letters) as the type of new template, then click OK.
You can download the settings file bingo_phonemic_awareness.bcp by clicking here. Save the file to a folder of your choice on computer. Note: Expert users who wish to download all the settings files (for all the bingo projects on this site), and all the PDF files (containing our free printables), as one combined ZIP file (which you will then need unpack to extract the individual files), can do so by downloading bingo_templates.zip by clicking here.